RECONECT is a Horizon 2020 project that aims to enhance the European reference framework on Nature Based Solutions (NBS) for hydro-meteorological risk reduction by demonstrating, referencing, upscaling and exploiting large-scale NBS in rural and natural areas. 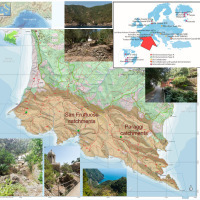 The Pilot site is the Portofino Natural Regional Park (Ligurian Apennines), 25 km E of Genoa. The park extends along both sides of the Promontory of Portofino, facing Tigullio and Paradiso Gulfs, under the Municipalities of Camogli, Portofino and Santa Margherita Ligure. 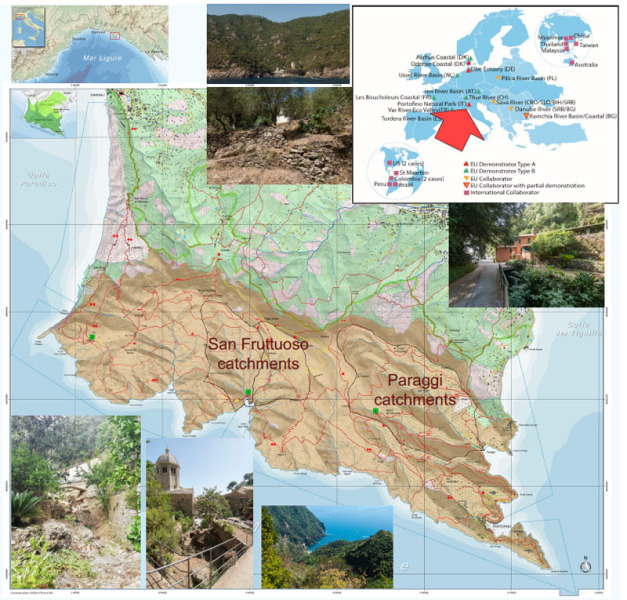 The Portofino Natural Regional Park represents a unique natural landscape element with high social, ecologic and economic (touristic) value, severely endangered by: 1) Floods (flash floods and hyperconcentrated floods); 2) Landslides (shallow landslide and rockfall). RECONECT Project, with an interdisciplinary partnership between researchers, industry partners and stakeholders, aims to contribute to European reference framework on NBS in rural and natural areas. By stimulating a new culture for land use planning it links the reduction of risks with local and regional development objectives in a sustainable way. RECONECT draws upon a network of carefully selected Demonstrators and Collaborators that cover a wide and diverse range of local conditions, geographic characteristics, institutional/governance structures and social/cultural settings to successfully upscale NBS throughout Europe and Internationally. To achieve these goals, the RECONECT consortium (coordinated by UNESCO-IHE and totally gathering 36 partners) brings together an unprecedented transdisciplinary partnership of researchers, industrial partners (SMEs and large consultancies) and authorities/agencies at local and watershed/regional level. The demonstration activities will be carried out at four catchments (Pilot sites): the two San Fruttuoso Catchments (Rio dei Fontanini and Vallone di San Fruttuoso) and the two Paraggi Catchments (Fosso dell’Acqua Viva and Fosso dell’Acqua Morta). The interventions foreseen in the pilot site will mainly be due to two types of solutions: NBS interventions (dry-stones walls construction and abandoned terraces restoration; hydraulic-forestry arrangements on watercourses; riverbed and tributary arrangements; natural engineering interventions along hiking paths) and other interventions (wood amelioration and re-forestation and hydro-geologic and meteoclimatic monitoring). Decrease of geo-hydrological vulnerability for the main infrastructures and the cultural heritage. Re-building/maintenance of dry-stone walls will contribute to restore old terraces and re-incentivize agricultural activities, with benefits for the landscape (terraces are part of the landscape and cultural heritage) and for geo-hydrological risk mitigation. Decrease of impacts by landslides and slopes instability at coastal sediment budget level. Decrease of risk injuries among park visitors due to instability of slopes in hiking paths during heavy rainfalls. Support the interaction between private landowners. Integrate the proposed NBS with regional policies for land management/planning and with River Basin management plans. Improve visibility and governance model of the Park, also in the perspective of becoming a National Park. Improve the collaboration between the Park Authority and the main local actors. In relation of future climate projections on the natural, social and economic impacts of climate change, NBS represent also for Italian Pilot a relevant mitigation and adaptation strategies, including novel responses to climate change.